Our mission at David Kurtzman, DDS, is to help you maintain your beautiful smile and those in your family with top quality dental care services. When a tooth is diseased or damaged, we have many options to restore it to health, including root canals and dental crown placement. However, not all teeth can be saved. When a tooth needs extraction, we offer a comfortable, stress-free atmosphere for our patients when removal of the tooth is the best or only option. Most people do not relish the idea of undergoing tooth removal. However, Dr. Kurtzman is an experienced dentist that can ensure the procedure goes smoothly and painlessly. Most anterior, or front, teeth can be removed quickly since they only have a single or double root. Molars can be more complicated, with up to four roots, but most can be removed efficiently. Dr. Kurtzman carefully reviews x-rays before extractions to ensure the tooth is removed without doing any damage to the surrounding teeth. While sedation is not needed for most tooth extractions, many people have anxiety at the thought of having a tooth removed. 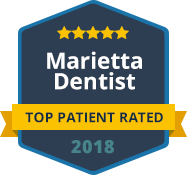 We offer sedation and sleep dentistry at our office in Marietta for a stress and pain-free removal experience. You can sit back and relax under the warm blanket of sedation while our team performs your tooth extraction. When you become aware, your diseased or damaged tooth will be gone. Our team will send you home with detailed instructions to care for your gums as they heal. In a few days, the tenderness will subside and the gums will heal. If you have a tooth that needs to be removed, you can trust our experienced team at David Kurtzman, DDS, for a comfortable, pain-free procedure. We offer sleep and sedation dentistry for those who fear tooth extractions or want a stress-free experience. Contact our office today to schedule your appointment for an exam.